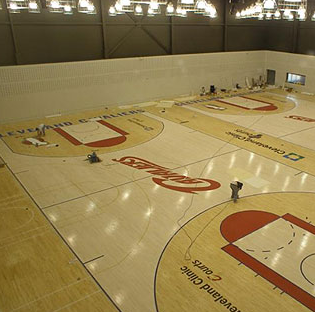 The new Cavaliers training facility, Cleveland Clinic Courts, will open today in a grand opening ceremony at 2:30pm. The $25 million, 50,000-square-foot facility has everything a professional basketball player could want, including a massive workout area and locker room, two full-length courts, underground parking and around-the-clock availability. The Cavs, will house all their basketball training in the new building in Independence, just south of downtown Cleveland on Interstate 77. The workout room is 3,000 square feet, and thatâ€™s not counting a large training room, a laundry room and a doctorâ€™s office that has a direct link to the Cleveland Clinic. The facility also contains a visiting locker room that can be used by opposing teams that are in town a day before a game, while the Cavsâ€™ massive locker room area almost defies description. Extra large, strength and conditioning training area that over looks the playing court area. Large theater-style team meeting room for video instruction with over-sized seating. Three spacious locker rooms for Cavs players, visiting teams, and staff.